These extraarticular fractures occur most commonly in children. Ninety-five percent are displaced posteriorly as a result of an extension force. When the mechanism of injury is due to a flexion force, the much less common anterior displacement occurs. There can also be various degrees of abduction, adduction, and rotation of the distal fragment. 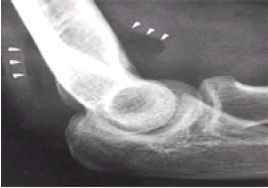 EXTENSION-TYPE FRACTURES In an extension-type fracture, the patient will have significant swelling and tenderness at the elbow. The olecranon is prominent, and there is a depression proximally over the area of the triceps muscle. 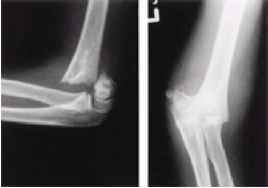 This appearance may be easily mistaken for a posterior elbow dislocation. Radiographs may reveal a fat-pad sign in undisplaced fractures ( Fig, 2.6.1-5). This is due to visualization of fat from the olecranon fossa (posterior fat pad) as it is displaced by the hemarthrosis. This may also occur anteriorly (anterior fat pad), although this is a less reliable sign. In some undisplaced fractures, the fracture line may not be seen, with the fat-pad sign being the only evidence of injury. Treatment should be initiated as though a fracture were identified, with splint immobilization and orthopedic consultation. In displaced fractures, the anteroposterior radiograph usually reveals a transverse fracture line. More severely displaced fractures may show medial or lateral displacement or rotation along the axis of the humerus ( Fig 2.6.1-6). The lateral radiograph will reveal the fracture line extending obliquely from posterior proximal to anterior distal. The distal fragment will be displaced proximally and posteriorly. FIG. 261-5. Anterior and posterior fat pad signs. FIG. 261-6. Displaced supracondylar fracture. The distal fragment is displaced posteriorly, proximally, and medially. The proximal fragment is displaced anteriorly and distally. Treatment of undisplaced fractures consists of plaster immobilization. Displaced fractures have the best results when reduced by closed methods followed by traction or pin fixation. Patients with displaced fractures or severe swelling should be admitted for observation of neurovascular status. FLEXION-TYPE FRACTURES Flexion-type fractures occur in fewer than 5 percent of supracondylar fractures. The mechanism is direct anterior force against a flexed elbow. This results in anterior displacement of the distal fragment. Since the mechanism is direct force, these fractures are often open. Radiographs reveal an oblique fracture from anterior proximal to posterior distal. The distal fragment is anterior to the humerus. Management consists of closed reduction and plaster immobilization or surgery if reduction cannot be maintained by closed methods. COMPLICATIONS There are numerous complications of supracondylar fractures, including nerve and vascular injuries and those occurring late, such as nonunion, malunion, myositis ossificans, and loss of motion. Associated injuries to the median, ulnar, and radial nerves have been well documented and have an incidence of 7 percent. Recently, Cramer and coworkers found a high incidence of anterior interosseus nerve injuries in their patients with supracondylar fractures. This nerve arises from the median nerve and innervates the flexor pollicis longus, the radial part of the flexor digitorum profundus, and the pronator quadratus. Since there is no sensory component to the anterior interosseous nerve, identification of the injury can be made only by specific muscle testing. Testing consists of flexion at the index finger distal interphalangeal and thumb interphalangeal joints. The mechanism of injury is usually traction, contusion, or a combination. Complete transection is rare, and entrapment within the fracture occurs only occasionally. Prognosis is excellent, with complete recovery in 2 to 6 weeks. Acute vascular injuries must always be suspected in patients with supracondylar fractures. Absence of a radial pulse is common in children. 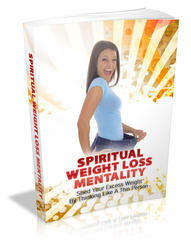 This is most frequently due to transient arterial spasm. Rarely, there is a partial or complete transection of the brachial artery, an intimal tear and thrombosis, or entrapment within the fracture fragment. The most serious complication is Volkmann's ischemic contracture. This classically occurs after a supracondylar fracture, when edema reduces venous outflow and arterial inflow. This results in ischemia, which, if unrelieved, will lead to muscle and nerve necrosis and eventual replacement by fibrotic tissue. Refusal to open the hand in children, pain with passive extension of the fingers, and forearm tenderness are signs of impending Volkmann's ischemia. It is now well understood that the mere lack of a radial pulse does not indicate ischemia unless accompanied by these signs. Treatment of supracondylar fractures with absent radial pulse begins with fracture reduction and pinning. Extremities still without a pulse and with signs of ischemia are taken to the operating room for fasciotomy and/or brachial artery exploration. Extremities without a pulse and no signs of ischemia may be treated in one of 3 ways: (1) close observation, (2) observation for 24 to 36 h followed by arteriography and surgery if indicated, or (3) immediate surgical exploration.